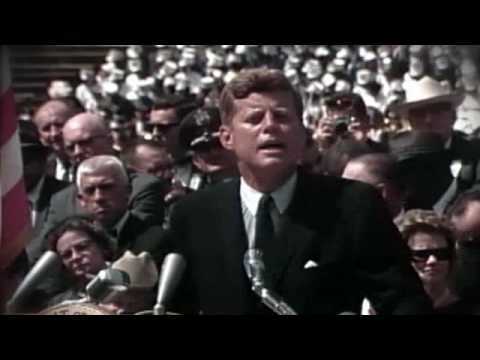 On This Day – 28 June 1963 – JFK’s speech to Dail Eireann. He was the first American President to visit Ireland, the country from which all eight of his great-grandparents had fled in the 19th century. John Fitzgerald Kennedy described his visit to Ireland in June 1963 as one of the most emotional periods of his life. One of the highlights of the trip was when he became the first US Head of State to address Dail Eireann. In the course of an enthusiastically received speech he referred to the country of his ancestry as ‘one of the youngest of nations, and the oldest of civilisations’. The 13th day of September, 1862, will be a day long remembered in American history. At Fredericksburg, Maryland, thousands of men fought and died on one of the bloodiest battlefields of the American Civil War. Fredericksburg was all of the above, except that the battle was being fought on 13 December in Virginia, not September in Maryland. The Irish Brigade would have been heavily involved in the Battle of Antietam in September 1862. The President also referred to the Brigade having been led into battle by its commander Thomas Francis Meagher. By and large that was the case, but not at Fredericksburg. Meagher was recovering from wounds at the time. He did not lead his troops into battle, he sent them into battle. 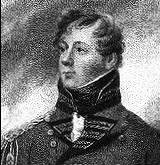 Much has been made of the joking reference of Kennedy to one of the former occupants of Leinster House, the putative Dublin leader of the United Irishmen rebellion of 1798, Lord Edward Fitzgerald. The President related how Fitzgerald had once written to his mother about the ancestral pile, that ‘Leinster House does not inspire the brightest ideas.’ The quip was greeted with laughter that was closer to raucous than polite. One person, however, was definitely not amused. That was President Eamon de Valera. According to Ryan Tubridy’s book on the Kennedy visit, JFK in Ireland, the former Fianna Fail Taoiseach took the President to task about the remark, thinking that it reflected badly on the acumen of the assembled TDs. He later, according to Sean Lemass, sought to have the joke expunged from the Dail record. But the Long Fellow has been cheated by the internet. Despite his best efforts, when you go online and seek out the speech on the Oireachtas website, there is the Fitzgerald joke in all its mordant humour. However the Dail record has been altered in at least one respect. About twelve minutes into his address the President invoked the motive force behind the so-called Patriot parliament of the 1780s and 90s, Henry Grattan. In audio and video recordings he is heard clearly to say ’83 years ago Henry Grattan, demanding the more independent Irish Parliament that would always bear his name, denounced those who were satisfied merely by new grants of economic opportunity.’ He probably meant to say 183 years ago, which would have been 1780. As Grattan had died in 1820 he would not have been around to say anything very much 83 years before. But the Dail record has been amended to read … ‘Over 150 years ago, Henry Grattan, demanding the more independent Irish Parliament that would always bear his name, denounced those who were satisfied merely by new grants of economic opportunity.’ While the scribes were happy to allow the President to falsify American history he was not going to be permitted to misplace our Henry Grattan by a century. The President also chose this occasion to use one of those memorable phrases that is most associated with him. ‘Other peoples … see things and say: `Why?’ … But I dream things that never were—and I say: `Why not?.’ The phrase has also been attributed to his brother Robert. In fact – as JFK acknowledged at the time, it comes from George Bernard Shaw, featuring in his play Back to Methusaleh. He left the country after four days, promising to return. He never did, an assassin’s bullet five months later made sure of that. 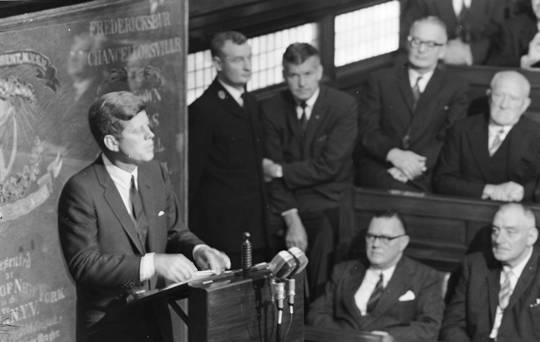 John Fitzgerald Kennedy, 35th President of the United States, addressed Dail Eireann fifty years ago, on this day. Few Irishmen are associated with the states of Java, Sumatra or Nepal, but the elegantly named Rollo Gillespie had ties to all three in his short and eventful life. Essentially he served in army units in the far-east – hence the link with these exotic locations. Gillespie was born in Comber in Co.Down on a date unknown in 1766. At twenty years old, in the pattern of the times, he was involved in a duel in which he killed his opponent. He fled to Scotland but returned to stand trial two years later, where he was acquitted when a verdict of justifiable homicide was returned. In 1792 he was shipped out with his cavalry unit, the Light Dragoons, to Jamaica. He was, however, shipwrecked and when he managed to get to the island of Madeira contracted yellow fever. After his recovery he was made Adjutant General of St.Domingo where, one night eight unfortunate thieves broke into his house in an attempt at burglary. Rollo killed six of them with his sword. The other two barely managed to escape with their lives. He then transferred with his unit to India. While there he was accused of fraud but was, once again, acquitted, on this occasion by a military court. While in India he, almost single-handedly rescued a unit consisting of sixty men during the Vellore mutiny of 1806. After a successful sojourn on Java he transferred to Nepal in 1814 where he took part in a small war against the Gurkhas. In an attack on a Gurkha hill fort he was heard to shout the words, ‘One shot more for the honour of Down’ – a cry normally heard on a football field. They were his last. 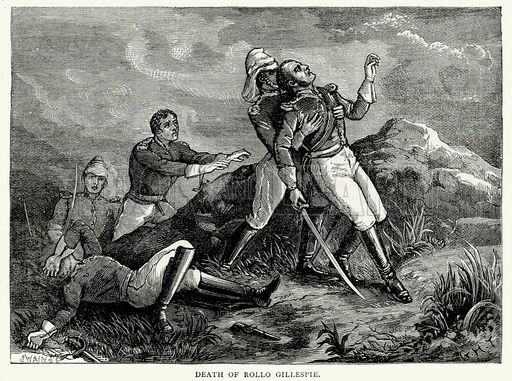 A Gurkha sharpshooter, probably attracted by his sentimental urgings, drew a bead on Rollo and put a bullet through his head. He died almost instantly. Rollo Gillespie reached the rank of Major General in the British Army. A 55 foot high memorial was erected to him in Comber. 50 lodges of the Masonic order attended the dedication, which took place 168 years ago, on this day. A memoir of major-general sir R.R. Gillespie [by W. Thorn.]. They made for a distinctly odd couple. Natives of two of the great east coast cities of the USA, both had been tempered by war and were united by their professed religious beliefs. But they had little else in common. They were separated by a generation and by modernity itself. John F.Kennedy, forty-six years old, at the height of his power and influence, a progressive leader of the richest and most potent nation on the planet, waved enthusiastically to the adoring crowd. Eamon de Valera the conservative eighty-year old ailing figurehead of a failed political backwater – one he largely created himself – stood, remarkably erect, nodding to the crowd, probably conscious of his subaltern status, on this day at least, in his own capital city. This writer was a nine-year old onlooker, smitten by the gesticulating Camelot Prince, the tanned, handsome lace-curtain Irishman from Boston, while merely curious about the elderly statesman, originally from New York. It was a powerful image. Youth and vigour juxtaposed with age and infirmity. The future standing alongside the past. Of course, like many images, it was an illusion, as beguiling as Camelot itself. It is no coincidence that the TV series Mad Men is set in the 1960s. It was the dawning of the age of the brand. And John Fitzgerald Kennedy was an ad man’s dream. He was a smart, personable, articulate war hero and he ‘looked Presidential’. Before Madison Avenue got hold of presidential elections it didn’t much matter how you looked. You could even be confined to a wheelchair. He was already a ‘brand’ long before he arrived in Ireland in June 1963, perhaps even before he took over the White House in January 1961. With iconographers like Theodore Sorenson and Pierre Salinger cultivating and honing the Kennedy narrative he could hardly fail. Fifty years later he is a mythic figure. Myth=branding + time. And his credentials as a supposed political progressive – at least in a European sense – don’t stand up to much examination. In 1957 he opposed Eisenhower’s civil rights legislation. He persisted, when in office, with the Democratic party practice of appointing judges to federal courts in the south who were acceptable to the southern Democrats. One such JFK appointee, Harold Cox, once described African Americans as ‘chimpanzees’ after he had been elevated to the federal bench. During his first term as a senator Kennedy teamed up with the darling of the Republican right, Barry Goldwater, to try and keep rock and roll music off American radio stations. He presided over the assassination of a supposed ally (and fellow Catholic) in Ngo Dinh Diem, beleaguered president of South Vietnam. He was also a cold war warrior, a member of the generation that rapidly moved on from fighting fascism to perceiving communism as an even greater threat. He was a product of his times who exemplified many of the partisan complexities and personal compromises inherent in the often perplexing American political system. Which is not to say that Kennedy’s regime was all about style, image and misdirection. His achievements speak for themselves, though much of what stands to his credit today were initiatives brought to fruition by his successor, Lyndon Johnson. But let us not allow ourselves, as we frequently are, to be completely dazzled by the undoubted glamour and charisma of the man. Better to operate on the principle that ‘by their fruits shall ye know them’. The alternative, to fall victim to political mesmerism, is a three-stage process. First we’re bewitched, then bothered, finally we come to the point at which we’re just plain bewildered. For those who weren’t around in the 1960s, think the Prismatic President, Barack Obama. The difficulty with inspirational rhetoric is that it comes minus the caveats of realpolitik. Thus: ‘Ask not what your country can do for you, but what you can do for your country (… as long as the Southern Democrats don’t start screwing around in the Senate.’) Or: ‘Yes we can (… provided the Republicans don’t control the House of Representatives.’) In response to an inspiring orator like Kennedy or Obama we tend, willfully, to delete the qualifiers and succumb to the rhetoric. However, for all his faults, and because of the unfulfilled promise it is always tempting to ask ‘What if it had been raining on 22 November 1963 in Dallas?’ This is the tantalising Kennedy counter-factual. Obviously there would have been no Presidential open-top motorcade and Lee Harvey Oswald – or the Mafia, or the man on the grassy knoll, or the four French hired assassins from Marseilles, or whatever other conspiracy theory you subscribe to – would have been denied the opportunity to demonstrate his/their peerless marksmanship and Kennedy would have seen out his first term and probably been re-elected in November 1964. There is no doubting his popularity in 1963. JFK was elected with just over 49% of the votes cast in the 1960 race for the White House. While in office his approval rating rarely dipped below 60%. After the Cuban missile crisis his ratings were in the high 70s. In a poll of 1960 voters taken after his death 70% claimed to have cast their ballots for him as President. So what would that second term have been like? How would he have governed from November 1963 to January 1969? Would he have embroiled America in the Vietnam war in the same manner as his successor, Lyndon Johnson? Would he have managed to pass the civil rights legislation that he had initiated before his death? Perhaps we only need to watch the next four years of the Obama administration to figure all that out! Because Kennedy would not have ‘governed’ from 1964-1969, he would, like Obama, have been at the mercy of Congress. The essential difference is that JFK faced the opposition of Neanderthals who make the Tea Party look like Earl Grey and cucumber sandwiches. Obama is, by and large, blessed with the support of most of those members of the House of Representatives and Senate who call themselves Democrats. Back in 1963 Kennedy had to deal with ‘Dixiecrat’ legislators from the south with, in some cases, had more than a sneaking regard for the Ku Klux Klan. Many were themselves heavily invested in modified white cotton bedding. Some felt that their African American constituents should still have been harvesting the raw material, gratis. John Boehner is a gentleman by comparison. We know some of what Kennedy wanted to achieve before Oswald intervened. His 1963 executive order reducing the number of American military ‘advisers’ in Vietnam by 1000 suggests that he did not see the commitment to South Vietnam as open-ended. Lyndon Johnson did not concur. But would Kennedy have been able to resist the demands of the Pentagon and the congressional ‘hawks’ and continue to downsize in south-east Asia after 1964? Barely a year after the Dallas assassination Johnson had installed thousands of American ground troops in Vietnam, to the detriment of his presidency and his legacy. Would Kennedy have been able to push through the civil rights legislation that he, belatedly, had begun to champion? While he had exploited the arrest of Martin Luther King just before the 1960 election to garner increased African American votes he spent the next three years ignoring King’s pacifist message and generating the sort of militancy in the African American community that King sought to curtail. While the intentions of his civil rights legislation were honourable Kennedy had a track record with Congress not dissimilar to that of Obama. He was reluctant to get down and dirty with the throwbacks and clientelists of Capitol Hill. Johnson had no such compunctions. It was Johnson’s intimate acquaintance with the use of political power that ensured the passage of the 1964 Civil Rights act. June 1963, when he came back to Ireland, was a big month for John Fitzgerald Kennedy. On June 10 he made a major foreign policy speech at the American University in Washington DC. In a world dominated by ideas of mutually assured destruction he seemed, in the speech, to be extending an olive branch to the Russians. He announced that the Soviet Union wanted to negotiate a test ban treaty and that the US was postponing atmospheric tests of its own nuclear arsenal. The following day, after Governor George Wallace of Alabama had been forced by Federal intervention to, literally, step aside and allow two African American students to pass into the campus of the University of Alabama, Kennedy made a largely improvised address on national radio and TV, promising equal access to public schools and enhanced voting rights, to African American citizens. Then on 26 June he made his famous ‘Ich bin ein Berliner’ speech (the ‘ein’ was superfluous) in the divided German city a short time after viewing the newly erected Berlin wall. His subsequent visit to Ireland, while of huge sentimental significance, registered a 2.5 on the political Richter scale in the USA. Such energetic activity on the foreign and domestic front may have heralded a renewed activism, a desire to propel his administration into a new orbit, an impetus finally to lead rather than to await developments, fly kites and dispense with the 1963 equivalent of safe focus-group politics. But would it have yielded results? John F.Kennedy died before Enoch Powell wrote in his 1977 biography of Joseph Chamberlain that ‘all political lives, unless they are cut off in midstream at a happy juncture, end in failure …’ It’s hard to think of an example that contradicts Powell’s axiom. Would Kennedy have been one of those rare exceptions? Probably not. Almost three years into his term he had failed to bring about the sort of change he promised in his (or Theodore Sorenson’s) stirring inaugural speech. The likelihood is that he would have been re-elected in November 1964, become bogged down in battles with Congress and have limped to the mid-terms in 1966 and lame duck status. Such is the nature of U.S. governance. It is perilously easy for their, theoretically sound, system of checks and balances to become a profusion of roadblocks and barricades. Johnson, who could bully his way around Capitol Hill, might have helped push through the proposed civil rights legislation, much as he did during his own Presidential term. But such an enormous expenditure of political capital would have fatally depleted Kennedy’s legislative reserves. Different questions, but along similar lines, confront the current Democratic presidency. On the evidence so far, Barack Obama’s tenure, from which so much was expected, is the JFK presidency for slow learners. Their Irish origins are mysterious, though they were almost definitely a 19th century agrarian secret society. Their name may have emanated from a tradition that was not just Irish – the Welsh were party to it as well in the so-called Rebecca riots – where male activists disguised themselves as women before engaging in illegal activity up to and including murder. They may have also have been associated with the main Roman Catholic rival to the Orange Order, the Ancient Order of Hibernians. But it wasn’t in Ireland that the Molly Maguires made a name for themselves.It was in the anthracite mines and on the rail-roads of Pennsylvania. Here, the tactics used against landlords and land agents in Ireland, were applied in bitter labour disputes, with the Hibernians, an organisation that originated in the USA, acting as a legitimate front for the illegal activities of the Mollies. Then again there are historians who do not believe this shadowy conspiracy ever existed on the scale that was claimed by the owners and shareholders of the mines and railways in late 19th century Pennsylvania. That is a point of view widely held at the time as well. Immigrant labour offered a glorious opportunity for Pennsylavania capitalists to undercut the wages being paid to American-born miners. Pay for Irish migrants was low and conditions were brutal. On the job fatalities and injuries ran into the hundreds each year. The so-called ‘panic of 1873’ – not a million miles from the stock market crash of 1929 and the sub-prime crisis of 2007 made a bad situation even worse for the mine and railroad workers. Just as every crisis brings opportunity, mostly for the unscrupulous, the President of the Philadelphia and Reading Coal and Iron company, Franklin Gowen, son of an Irish immigrant and the richest man in the region, decided it was high time to crush the burgeoning trade union activity in the state, represented by the Workingmen’s Benevolent Association. 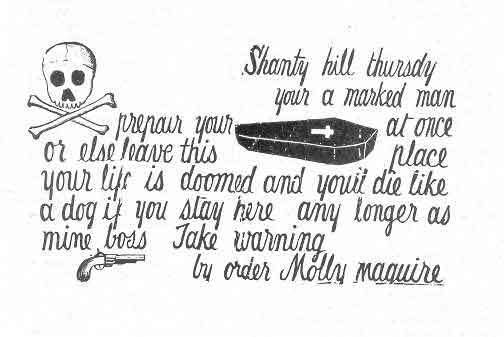 While the ‘Molly Maguires’ may have been the convenient invention of Gowen himself there is no doubt that the perceived enemies of the Pennsylvania mineworkers were being killed by the dozen. In one of the six main anthracite mining counties there had been 50 such murders between 1863-67. Gowen, with the co-operation of his fellow mine owners, engaged the services of the yet-to-become-famous detective agency run by Scottish immigrant Allan Pinkerton, to help break a general strike in the anthracite fields. In 1875 he despatched an agent, Armagh-born James McParland, to the area. Posing as ‘James McKenna’ the Pinkerton detective infiltrated the Benevolent Association and claimed also to have insinuated himself in to the confidence of the Molly Maguires. Information gathered by McParland was, in the first instance, passed on to vigilante elements who happened to share Gowen’s union-bashing objectives. When suspected Mollies were murdered in their own homes McParland threatened to resign from the Pinkerton organisation but was persuaded to remain in place. 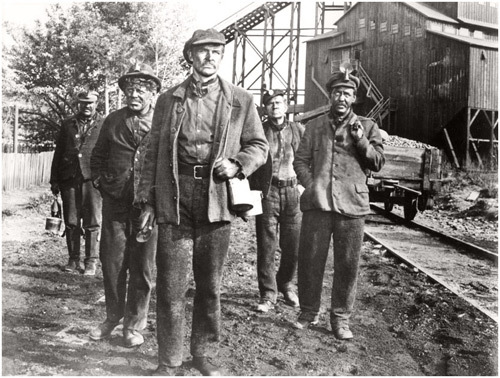 After six months the strike ended and most of the miners returned to work having agreed to a 20% wage cut. However, Irish-born members of the Ancient Order of Hibernians refused to concede and fought on. Attacks on overseers, strike-breakers and police continued until information supplied by McParland led to a number of arrests. 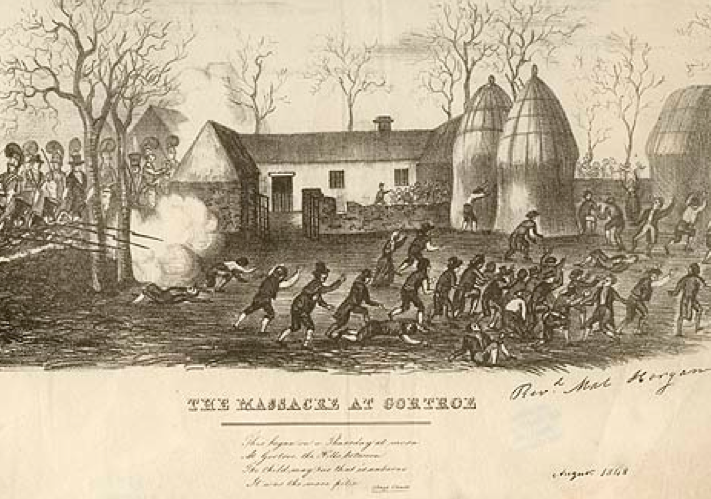 The Armagh Pinkerton, who had, by his own account, been a trusted collaborator of the leadership of the Mollies, testified against a number of those accused of murder. Demonstrating the extent of his political power within the state of Pennsylvania Gowen had himself made special prosecutor and conducted some of the cases against the Mollies. The accused included the alleged ringleader of the organisation John ‘Black Jack’ Kehoe. McParland’s testimony sent ten men to the gallows. Many of them, including Kehoe, loudly proclaimed their innocence of the crimes of which they had been convicted. In 1979 the state of Pennsylvania pardoned Kehoe posthumously after an investigation by its Board of Pardons at the behest of one of his descendants. The Molly Maguires have passed into legend. Arthur Conan Doyle based a Sherlock Holmes mystery, The Valley of Fear on their alleged activities. The 1970 film The Molly Maguires, starred Sean Connery as Kehoe and Richard Harris as McParland. Four members of the alleged Molly Maguires conspiracy, Alexander Campbell, John Donohue, Michael Doyle and Edward Kelly were hanged in Pennsylvania 134 years ago, on this day. 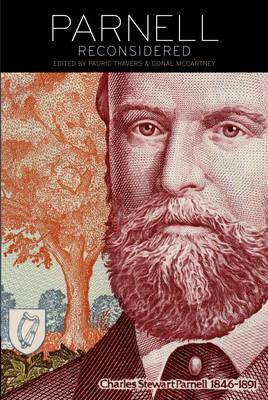 In the grand scheme of things in 19th century Ireland, dominated by Daniel O’Connell, Parnell, the Fenians, the Land War and Home Rule, a bitter land conflict of the 1830s, the Tithe War, seldom gets a look in. This is partly because it produced no charismatic leaders and ended in something of a fudge rather than a glorious victory or a tragic defeat. Tithes were levies paid by certain farmers, not to their landlords, but to the Church of Ireland, the Established Church, so-called, until Gladstone finally separated it from the state in 1869. Needless to say this form of taxation was bitterly resented, not just by Roman Catholics, but by Presbyterians mostly based in Ulster. While no one liked paying rent to landlords at least you got something in return. Catholics and Presbyterians got nothing back from the money paid out in tithes. What made things worse was that in certain parts of the country the local CofI rector might well have sold on his interest in the proceeds of the tax to a wealthy local called a ‘tithe farmer’. Many of these were Catholics. Even more inequitable was the fact that, by and large, tithes were a tax on crops rather than livestock. Only the most prosperous of landholders could afford to devote their farms to pasture, but if they did so they were exempt from tithes until a new Act of Parliament in 1823. Between 1830 and 1838 an agrarian conflict erupted which had a nasty sectarian quality to it. Catholic peasants, disillusioned that the hard fought campaign for Catholic emancipation had brought about no improvement in their lot, fastened on tithes as an iniquitous imposition, which indeed they were, unless you happened to be a member of the Church of Ireland anxious to support your local clergyman in some considerable luxury. In something of a dress rehearsal for the Land War of the 1880s the Tithe War began in Kilkenny, Wexford and Tipperary with public meetings of men carrying hurley sticks which could be represented as sporting occasions. Soon farmers were refusing to pay tithes. 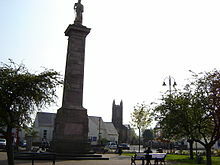 One of the worst incidents of the Tithe war took place on 18 June 1831 in Newtownbarry in Co.Wexford. There the local Anglican rector, supported by his bishop, insisted on the seizure of the livestock of farmers who had refused to pay the tax. At the auction of the distrained cattle some of the beasts got loose and when their owners attempted to reclaim them they were fired on by the yeomanry, a local Protestant militia. They refused to cease firing even when ordered to do so. When the shooting finally stopped eighteen people had been killed. The violence was, however, not entirely one-sided. In December of 1831 a force of 38 armed constables and a process server delivering summonses to tithe defaulters was set upon by local people in Carrigshock, Co.Kilkenny. An attempt was made to force the process server, Edmund Butler, to eat the summonses. He was hit by a rock from the crowd and the police were then attacked by a hail of missiles. Thirteen of them, as well as Butler, were stoned to death, or killed with pitchforks. The Tithe War finally ended with a compromise in 1838. The much-loathed tax would no longer be paid by Roman Catholic tenants, but by their landlords, most of whom, outside of Ulster, were members of the Church of Ireland. It was, however, mostly a fudge, as the landlords simply passed the payment on to their tenants in higher rents. The killing of eighteen members of the community of Newtownbarry, Co.Wexford, took place 182 years ago, on this day. Each year at the Parnell Summer school (and the Spring Day) deals with a current topic of interest – in recent years the Irish media and education in Ireland have been considered. But space is also left for one or two papers annually devoted to further investigations of Parnell, Parnellism or of the period when ‘The Uncrowned King of Ireland’ was in his pomp. A number of those papers has now been collected by Professor Pauric Travers of St.Patrick’s, Drumcondra and Professor Donal McCartney (professor emeritus UCD) in a new volume Parnell Reconsidered and published by UCD Press. The essay on the Parnellite newspaper United Ireland, entitled ‘Mr.Parnell’s rotweiler’ was written by yours truly and is a rather more pithy version of a Trinity College PhD thesis. It could also stand as an abstract of a book on the subject of William O’Brien’s newspaper that will be published by Irish Academic Press in 2014. My thanks to Pauric and Donal for being wonderful, patient editors and to Donal for reading the damn thesis before it was submitted. Alcock and Brown’s first transatlantic crossing – On this day, 14 June 1919. In April 1913 the Daily Mail offered the substantial prize of £10,000 to ‘the aviator who shall first cross the Atlantic in an aeroplane in flight from any point in the United States of America, Canada or Newfoundland to any point in Great Britain or Ireland’. 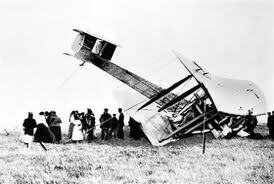 At the time aerial flight was in its infancy and thanks to the intervention of the Great War there were no takers until well after the 1918 armistice. During the conflict two British prisoners of war, John Alcock from Manchester and Arthur Whitten Brown born in Glasgow but also a Mancunian, had plenty of time to think about that £10,000 and what they might do with it. Alcock had come to grief in an air raid over Turkey, Brown was a guest of the Kaiser after having been shot down over Germany. Both men became involved with the Vickers corporation in the post war competition to be the first to make a non-stop transatlantic flight. Alcock was taken on first, as pilot, Brown was then added to the crew as navigator. Their main rival was a team from the Handley Page company. The Vickers crew adapted a Vimy twin-engined bomber for the race, replacing the bomb bays with additional gasoline tanks. They carried nearly 900 gallons of aviation fuel. Alcock and Brown took off from Lester’s Field, Newfoundland at 1.45pm on 14 June. They flew at between sea level and 12,000 feet, depending on weather conditions. Brown’s navigational instincts were vital for their survival as their airspeed indicator malfunctioned early on and he had to estimate the distances being covered every hour in order to avoid flying miles off course. They made landfall after less than sixteen hours in the air, spotting what they thought was a green field near Clifden in County Galway. It turned out to be bog. Both men emerged unscathed from the experience, having covered more than 3000 kilometres in an average speed of 185 kph. One of the first locals to greet them was reporter Tom Kenny owner of the Connaught Tribune, who grabbed an interview before the Daily Mail correspondent could reach Derrygimlagh bog. The scoop went worldwide. Kenny’s son Des later established the world famous Kenny’s Bookshop in Galway. 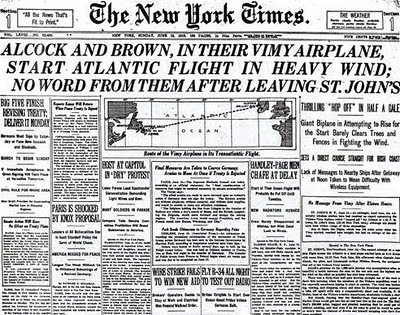 News of the successful flight was relayed from the Marconi transatlantic wireless station just a few hundred yards from where Alcock and Brown had made landfall. The pilot and navigator were feted internationally. They did well to survive the hospitality of their Clifden hosts and within days they were knighted by King George V. Alcock did not live very long to enjoy his share of the fame and the prize money. He died the following December at an air show in France at the age of 27. Brown lived through World War 2 and died in 1948 at the age of 62. They weren’t actually the first to fly the Atlantic. A fortnight beforehand the ocean had been successfully negotiated by a US navy flying boat piloted by Lt.Commander Albert Cushing Read. But that had taken 23 days and involved half a dozen stops, so it didn’t qualify for the Daily Mail prize. Alcock and Brown set off into the unknown for a date with history and a Clifden bog 94 years ago, on this day.